Everything becomes distraction and reaction when you lose control of you calendar. A commitment is a decision made once. Commitment #1: Protect white space on your calendar. In the past, when someone called for an appointment, I looked for blocks of open space on my calendar. Now I look for times when I’m busy. I choose to schedule appointments back-to-back on one morning to protect white space on another. It’s one of the best commitments I ever made. Don’t schedule appointments back-to-back all day. Make an appointment with yourself, if you need to. However, for short blocks of time, back-to-back is efficient. Prepare for meetings in advance, if you’re going back-to-back. Include short breaks, even when you’re back-to-back. Schedule five minutes between meetings, for example. Disconnect from your last meeting. Stretch. Breathe. Focus on the next person or group. Let people know they matter by preparing for them. Set a limit. How many back-to-back meetings can you schedule and still be present? Commitment #2: No appointments at least one day a week. Every week, “extenuating circumstances,” invite me to violate this commitment. Additionally, my inner people-pleaser calls me selfish. Be flexible. The weeks I travel, for example, force me to adapt. Use the time to do your job without interruption. I prepare for presentations. Some leaders choose one day a week to work from home. Establish principles that guide the way you schedule appointments. 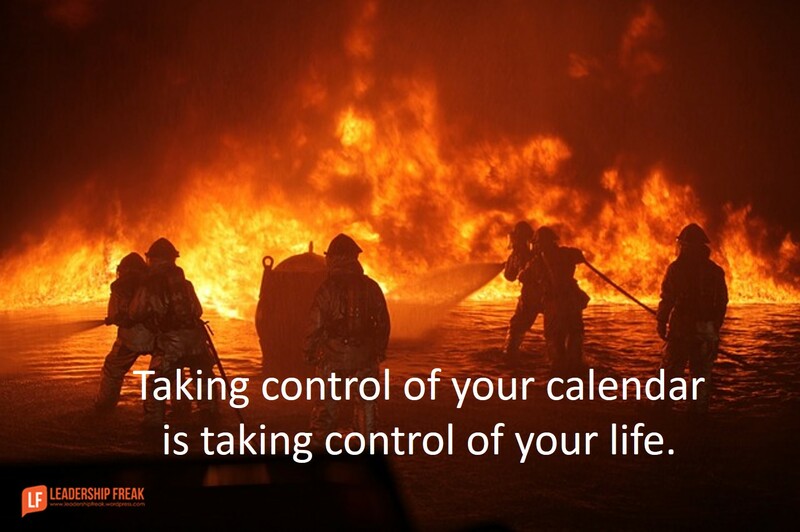 Taking control of your calendar is taking control of your life. What have you learned about controlling your calendar? I scanned down the page to see the comments on this one and was very surprised there were not any. Excellent ideas Dan. The prep piece really stood out to me. That is big. I am way too comfortable “winging” it. Proper prep sends a very clear message that I RESPECT that person. Is a powerful message that I want to send to every person on my calendar. Many times, my calendar is the only thing I can control. Meetings without proper preparation tend to be pointless and fruitless. Thank you for another great article. At my work place coworkers can see my calendar and my “white space” and schedule meetings with me when it appears I’m available. I actually block times on my calendar to work projects so I don’t get overrun by meetings, leaving no time to actually work on my assignments. It gives me some added control and flexibility. Great point! Another idea is meetings with vendors for sales calls. Previous manager role required me to stay plugged in with suppliers & contractors. So for general visits, I set up 2 days a week for 2 hours. Each vendor was given 20 min time slot & could not book again for 3 months. My admin took control policing the vendors & because of limited time got right to their points. Worked extremely well for me. It give them access to me but in my terms.